It’s no secret that I advocate for fitness solutions with real-world applications. I emphasize the importance of the body as a holistic system that demands maintenance and movement in a natural context. There are lots of ways to train the body within these guidelines, but today I’m going to talk about what may be the easiest (and easiest to neglect) way to ensure that your musculoskeletal system stays healthy. I’m talking about posture. Most of the time, people don’t notice their own posture. You have to call it to their attention. In today’s world, this problem is even more pronounced–we have a whole host of screens and devices that both keep us hunched over, and make us distracted so that we forget to be mindful of our body’s position in space. The hunched-over, rounded-shoulder “texting position” can lead to what’s called “Upper Crossed Syndrome.” The term was coined by Dr. Vladimir Janda when he noticed many people showing up with certain sets of muscles in the upper-anterior part of the body–like the pecs and upper traps–were actually abnormally shortened, and their counterpart muscle groups in the back were abnormally weak. Obviously, this isn’t what you want if you’re trying to develop a great golf swing. Heck, it’s not what you want if you want to be able to throw a ball, pick up a basket of laundry, or age gracefully either. The best way to prevent upper crossed syndrome is to be mindful of your body. You want to stand confidently, shoulders back, chest out. Click the video link below to check out some more tips on maintaining good posture. Louise H. of Menands says: “The program is well thought-out and gradually allows for better and more precise performance. I enjoy and look forward to working out every week.” Louise was voted most improved golfer at Wolfert’s Roost. I always stress the importance of preparing for physical activity by stretching. Golf is no exception. Most people think of pectoralis muscles as something gym rats use to show off, but they are an important interface between your arms and your core. As such, they are crucial to a good golf swing. I’m going to outline a few stretches you can use to ensure that you have your pecs’ full range of motion. Stand in a doorway, next to a tree, or next to a golf cart, and place your arm in the same position as you would if you were about to throw a ball. Place your forearm and hand against your support (i.e. the doorjamb or similar) with the palm toward the support and your forearm vertical. Gently rotate your trunk forward around your arm as though your arm were a stationary object. Once you have reached a position in which you feel a stretch on the medial rotators of your shoulder (the front area), take a deep breath and press your hand into the doorjamb. Hold about one pound of pressure on the doorjamb for five seconds. Exhale and rotate the trunk around the arm, increasing the stretch. This should be repeated three to five times. This image is an example. With the forearm on the ball, keep the shoulders parallel to the ground as you allow the arm to be stretched back by dropping the body forward. 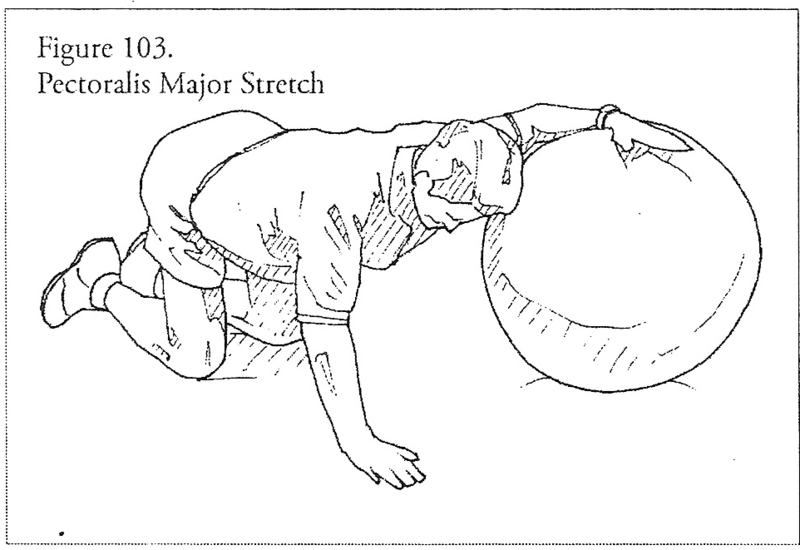 Upon reaching the point of a comfortable stretch, inhale and press the forearm into the ball for five seconds. After five seconds, exhale as you relax and move immediately into a new stretch position. Perform this sequence three to five times on each side. If you know anyone who could benefit from this information, please share it using the Facebook and Twitter buttons on the page! Most people don’t consider golf a very fitness-intensive sport, and indeed it’s not very intense in the cardiovascular sense, but it does require a level of control over the body that can only be achieved through athletic training and functional fitness techniques. The five pillars of golf’s kinetic chain–flexibility, balance, strength, endurance, and power—are at the heart of functional fitness training. What is functional fitness training? It’s athletic training with a focus on movements that emulate the natural motion of the body during sports and day-to-day activities. Our muscles and nervous systems are so delicately coordinated that training with the mechanical, one-dimensional motion provided by machines cannot prepare your body for real motion in space. It’s vital that your muscles learn to work all at once, supporting one another as they would in natural motion. Otherwise, it’s possible to develop a muscle imbalance and potentially set yourself up for an injury. Imagine a bridge built with heavy-weight, highly developed steel cable, but made with small, poorly-made bolts. That’s the kind of body you can get from limiting your training to gym machinery. Your kinetic chain will have weak links, and you won’t know they’re there until you get hurt. That’s why I focus on training for stability, mobility, and quality of movement before I even introduce strength training. Stability training is so important that I recommend doing 5-10 minutes of it before any workout. Bodyweight training is an excellent choice for strength training because it incorporates in itself aspects of stability training. It also allows me to assess a client’s imbalances, compensations, weaknesses, and symmetries. When you do bodyweight training, you’re engaging the whole of your body all the time, even if you’re only intending to work on a specific muscle group. This way, you develop better balance, and you also become more mindful of your body’s location in space; both of these are great skills to have whether you’re golfing or just leaning over to get something out of the fridge. For cardiovascular performance, I recommend athletic training as opposed to steady-state cardio training, like you would get on a treadmill or exercise bike. Athletic training means any exercise where you move like an athlete—fast, agile, and powerful. It increases your cardiovascular fitness and your total-body balance, and it’s also much more fun than traditional cardio. After your workout, it’s important to be able to return to a positive baseline state. Stretching, massage, foam rolling, and trigger-point techniques are tools that I can use to help my clients wind down and recuperate from the positive stress of exercise. If you find this helpful, please share with the buttons at the top of the page. I’ve talked about the five physical pillars of a good golf swing before: flexibility, balance, strength, endurance, and power. In previous weeks, I’ve talked about strength, balance, and flexibility, and this week I’ll address endurance, and what you can do to improve yours. A thorough pre-golf warm-up is something many people ignore, being more interested in getting out on the course as quickly as possible. A golf-specific warm-up will lubricate your joints, warm your muscles and connective tissue, activate your nervous system, and sharpen your senses. All in all, it will help improve your golf game. You can’t achieve great results using a muscle endurance warm-up routine. The golfer’s body will respond better to this type of exercise with people over 40, since the aging process produces degenerative change in joints, which decreases mobility. Walking 18 holes can be up to a five mile walk on uneven terrain. So what endurance exercise movements can you do in between rounds? All successful golfers will make the time for this. Don’t invest as much time in TV, reading, or even the driving range, and spend more time on rhythmic walking: twenty minutes a day, five days a week, NOT on a treadmill or elliptical, as this doesn’t mimic life or golf movements. During the rhythmic walk, change directions. Walk backwards one minute, then walk sideways thirty seconds each leg. This will ensure proper balance in the legs and core to improve performance and decrease injuries. You can also add skipping in your walk for fifteen seconds. Remember, to be better in golf endurance, you must be committed and be consistent. If you found this information helpful, please share it with a friend; it’s as easy as clicking the Facebook share button on this page!